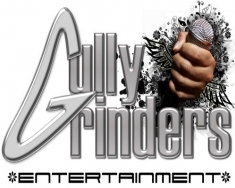 GULLY GRINDAZ ENT FROM LAWRENCE MASS USA. BRINGING A NEW STYLE TO RAP WITH A GHETTO AND CLASSIC SOUND. THE GROUP STARTED ABOUT 3 YEARS AGO. GULLY GRINDAZ HAVE BEEN IN THE STREETS MAKING A NAME FOR THEMSELVES .THEY EXPLAIN THE STREET LIFE AND GHETTO ENVIROMENT THEY COME FROM. ALL THE MEMBERS HAVE SEEN THEIR PART OF THE STRUGGLE FROM LOSING LOVED ONES, DOING JAIL TIME, AND THE EVERYDAY HUSTLE AND GRIND OF "MOVING THE ROCK ON THE BLOCK". FROM RAP BATTLES TO REAL LIFE ON TRACKS, GULLY GRINDAZ HAVE STREET CREDENTIAL. IN A RECENT INTERVIEW WITH D-RECKS(THE HEAD HONCHO OF THE 4 MEN GROUP)EXPLAINS HOW EVERYTHING THEY SPIT IS BECAUSE IT IS WHAT THEY LIVE AND EVERYTHING IS GULLY BECAUSE THAT'S ALL THEY KNOW. HE EXPLAINS HOW THE NAME GULLY GRINDAZ DEFINES A WAY OF LIFE. "GULLY" REPRESENTS THE STREETS AND "GRINDING" IS HOW YOU SURVIVE ON THE DAILY.